The United States has reached a crossroads where the people of this country need more than just ‘help’. We need people that can be trusted to stand behind whatever they are promising the public, in their everyday actions, that would supposedly back whatever anyone chooses to say about the current state of the dying U.S. & the world at this critical juncture in time. In the coming of Jade-Helm 15, as this constitutes “no threat” according to Gordon Duff. Can seriously be ignored by the public any longer? 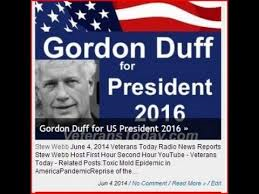 Who is Gordon Duff and WHY is he “Running for President in 2016”? Gordon Duff by his own admission has tens of millions of dollars at his disposal, yet Duff refuses to use any of his own money to help fund the VT radio and television stations which are both in dire need of basic funding? Duff says that both these shows are his shows and that they are both in dire need of funding ­ yet he refuses to use any of his own money. I’ve been listening to his statements over the past month, at some length and what he says are not the kinds of things that any serious candidate for any office would ever say—if indeed the ‘candidate’ ever planned to actually run for public office, much less “for the presidency” of this most colossal public failure which the United States currently is. 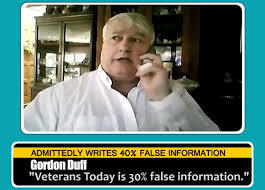 I believe that there are many Vets in this nation that are more than just “sincere” yet equally I can’t envision that any of their efforts will ever be assisted by Gordon Duff: Not when it really counts. If America is to survive then millions of U.S. Vets will be needed to assist the rest of us in that effort; given the huge amount of weaponry and ammunition stocks that are still being added to each and every day, by the treacherously fake government in this haunted place. As just another false-flag in the making. As his own statements continue to place him personally in doubt, even if he were not proclaiming his candidacy for the Presidency of the United States. It’s time that the real Gordon Duff stood up for whatever he stands for. About reversing the course of this crippled nation.